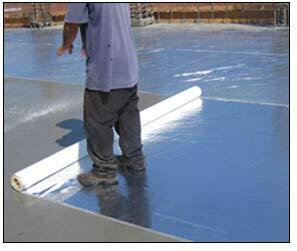 • Reflective vapor barrier helps reduce solar heating of the slab. • Less material overlaps of 2-5” mean less waste than most other curing methods. 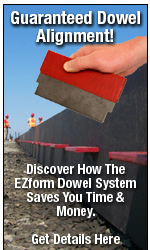 • Products meet or exceed standard specifications for sheet materials for curing concrete. The Short Term Wet Curing Blanket. 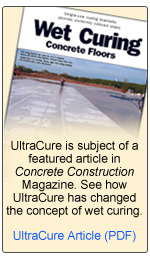 UltraCure OC™ (outside concrete) is a short term (3 day) wet curing blanket featuring a reflective vapor barrier which helps reduce solar heating of the slab by reflecting the sun’s radiant energy when used outdoors. UltraCure OC is designed specifically for tilt-up, parking decks, and walkways. With proper installation, the blanket helps prevent foreign material including dust, debris and contaminants from reaching the concrete surface. Each 2400 foot roll can absorb up to 60 gallons of curing water providing the critical moisture required for the short term wet curing of concrete surfaces. Using UltraCure OC also helps reduce material costs, installation labor, and totally eliminates the need of costly storage and transportation of traditional wet cure methods. Patent pending UltraCure OC is designed for indoor or outdoor usage.